Today, I’m sharing a short excerpt from the Childless by Marriage book, one I hope will make us all smile a little. 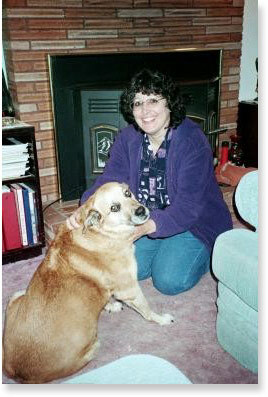 As editor of the Saratoga News, I often received press releases from The Pet Network, a local dog and cat rescue agency. Remembering the close bond I had had with Heidi, the German Shepherd I had shared with my first husband–and lost in the divorce–I decided I wanted another dog. Now that Fred and I had a house of our own, there was no reason we couldn’t have a dog. We started going to animal adoption fairs, visiting rescue dogs displayed at various area shopping centers. When we first met Sadie at a PetSmart store, her name was Snapple. A German Shepherd-yellow Lab mix, she had the same dark eyes as Heidi had, the same lush multi-layered fur, and the same plumed tail, with the sturdy body of a Lab. She was mostly the color of the Snapple iced-tea drink. The dog’s tail wagged faster. Two weeks later, Snapple was still there. Now they called her Sadie, having decided her name was discouraging potential owners. She was beautiful. As we leaned over to pet her, she licked our hands and wagged her tail. She didn’t seem to have any problem with the other dogs nearby that day. We asked to take her out for a walk. We strolled around the store, then sat on the warm pavement just outside the back door. This dog acted as if she was already part of the family. “Do you want to live with us?” I asked the dog. Her dark eyes sparkled as if she understood. We came back in, paid $100 for the dog, bought a leash, collar, bowl and food and loaded her into the Honda. Our cat wasn’t too happy with the new addition. When Sadie came bounding into the back yard, Lady, sleeping on the lounge in the patio, flew at her with teeth and claws extended. I grabbed her off the startled dog, and we started a life of dog in the back yard, cat in the front and never the twain should meet. It wouldn’t be for long. Lady had already been diagnosed with a rare form of skin cancer and would die a few months later, but things were tense for a while. Michael, Fred’s son, who had moved in with us a few months earlier, was happy with the new dog. When we weren’t around, he let her sleep in his bed. We started signing Christmas and birthday cards from “Fred, Sue, Michael and Sadie, letting people wonder if we’d had a baby girl. ← Happy dads, pets instead of kids . . .